Marie Bones, 39, qualified in 1998 and has worked as Tom Donnelly’s dental nurse and treatment coordinator since 1994. 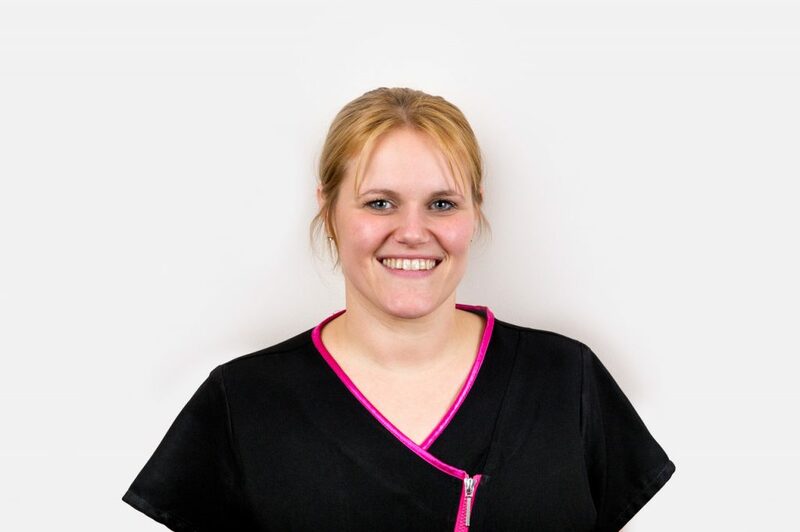 She loves nursing for Tom and has enjoyed developing enhanced skills in dental implants in Banbury. She is mum to two boys, aged seven and four. As mentioned in my first article, I worked with orthodontist Dr. Davey and saw some amazing end results. However, this particular case was difficult to restore in a conventional way. As an implant case to replace the damaged tooth, there would be a badly compromised aesthetic result with an extremely long tooth remaining. 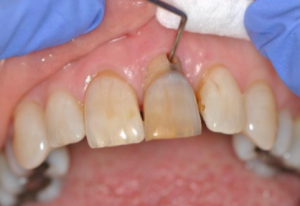 The patient was not interested in dentures or bridges – both would also have resulted in a compromised aesthetic result. However, with this situation, a combination of orthodontic treatment and implants was carried out in a way I had never seen before. I had heard of orthodontic extrusion, but I had not realised quite what this would entail. 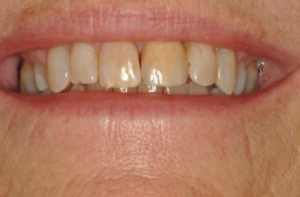 Did I also mention that it’s never too late for a smile makeover – as this patient is 67 years young? This patient came to the practice with concerns regarding the appearance of her front tooth. The tooth was traumatised as part of a childhood injury and had been compounded by an attempt to treat the tooth much later. It surprises me how people can put up with pain and discomfort for so long. This lady has had one to two years of discomfort but was reaching a point of not being able to control it. The tooth was becoming more painful, as well as preventing her from smiling. Personally, I feel that this needs immediate treatment, as pain and discomfort can have a major impact on a person’s quality of life. A huge part of our job in dentistry is to help people, relieving pain and discomfort and wherever possible, give a good functional and aesthetic result. This topic will be covered in a future article. The patient presented to Dr. Tom with an over-erupted, discoloured upper left central incisor. She has a high lip line and all her front teeth and gums show with her smile. The patient had previously been informed that the pulp chamber and canal had become calcified. Her dentist had tried to find the canal but, unfortunately, had perforated through the buccal surface of the root subgingival. This has resulted in infection. At this time, I knew it was going to become very interesting and I was curious as to what could be done. – The gap was larger than the adjacent central incisor. Unfortunately, the only option for this lady was to remove the tooth but, of course, this would leave her with a gap in the front, meaning she required aesthetic and functional replacement. The gum line was likely to become even worse with the loss of the tooth due to the almost complete lack of buccal alveolar bone. On discussion with the patient, leaving a gap was not acceptable. 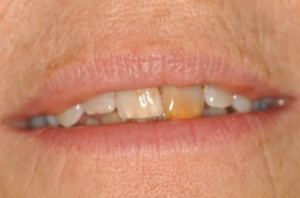 The patient was not interested in wearing a single tooth denture. The idea of a bridge adhesive or conventional was declined as the gum line and the excessive length of the tooth would be on show. Placing an implant even with immediate replacement on the extraction of the tooth was compromised by the almost complete lack of buccal alveolar bone. Gaining extra height of bone is considered to be difficult by standard grafting procedures. Gaining extra width is straightforward generally, but even with exotic attempts such as J bone grafts, bone height increases tend to be haphazard (except in the sinuses). Orthodontic space closure was inappropriate – the patient was too old and there wasn’t a good donor tooth available for transplantation. However, there was an option for the patient to attempt a combination of orthodontics and implant treatment. When a tooth is moved orthodontically, bone and gum will follow the movement. Orthodontic extrusion is an acceptable treatment for a failed root – in order to create bone and gum height. 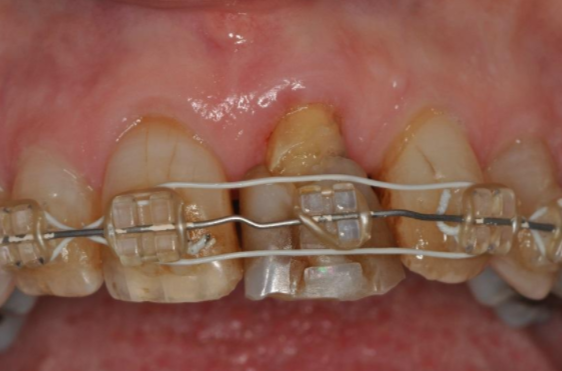 In these circumstances, the root is removed slowly by orthodontic pressures and over a period of many weeks. The patient was quite agreeable to the idea of this process and consented to the use of orthodontic treatment with the intention of placing an implant into the newly repositioned bone and with a better gum line. With all patients, replacing front teeth is challenging. Tom calls this ‘your shop front’. I agree with him – he’s right that appearance and smile are so important. In this case, the gap was larger than the adjacent central incisor. However, the patient was keener on filling the entire space rather than having some form of diastema. Giving all patients the full options including orthodontics, at any ages, is something that has to be considered. After six months of orthodontic extrusion treatment, this patient had formed new bone with a better smile line but what was needed next was a new tooth. This is where Dr. Tom’s expertise came in with implants. Leaving the wires and brackets in place on all the other teeth, the central incisor was carefully removed and the small socket cleaned of any debris. There was still a residual bony defect but it was mainly width – so the implant was placed using bone graft Bio-Oss covered with a Bio-Gide membrane to add further width to the site. The flap was released, to give full coverage of the site and to allow the Implant and graft to integrate. The crown of the tooth was removed from the root, the defect within the tooth was sealed with a flowable composite and this allowed the crown of the tooth to be retained by the orthodontic wires acting as a temporary tooth. This arrangement allowed the patient to have a temporary smile during the healing process. The implant was left for four months before uncovering and loading. 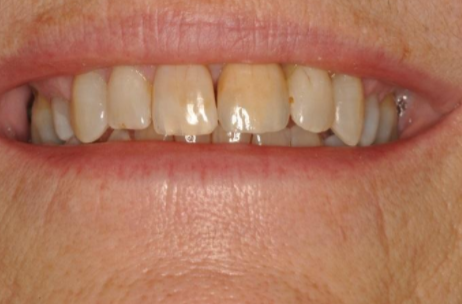 This lady had had a darker tooth for such a long time that she wanted her crown to be slightly darker than the other teeth, so this was taken into consideration when shading up to her natural teeth. 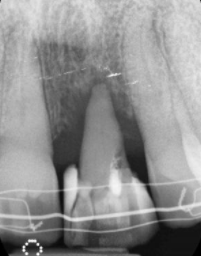 The crown was made to fill the gap, fortunately, the patient was quite happy with this. 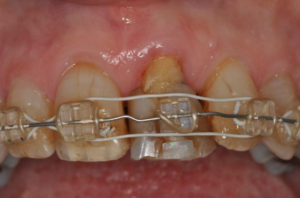 The original plan and positioning of the implant were to use a screw-retained bonded crown to allow flexibility in adapting her gum line and a degree of retrievability. Screw-retained crowns allow retrievability, the potential for removal of cleaning and the ability to adapt gum margins over a period of time. It does mean that there is a more critical placement angulation to allow the screw to be hidden in the less critical areas of the restoration. Cement-retained crowns allow more of fangled fit, although it can mean more difficulty in retrievability and a possibility of de-cementation. 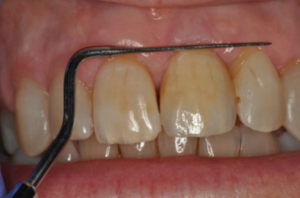 Cement can cause problems with cement induced peri-implantitis if it escapes into long epithelium After a lot of patience and a short journey of orthodontics, combined with an Implant, the time and effort of Dr. John and Dr. Tom has paid off. This lovely lady has finally got her confidence back with a wonderful smile, which I think you will agree was an amazing result. The next date for the Dental Implant Nurse course is Friday 17 November. For more information, visit The Implant Studio or call 01292 262008.